Pola de Laviana is a small town in Asturias, northern Spain, approximately 30Km from Oviedo and 30Km from the Costa Verde coastline. 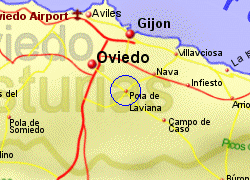 The town, surrounded by green fields and wooded hills, is situated on the Rio Nalon, which flows through the picturesque Redes Natural Park (great walking country), having come from the Picos de Europa. 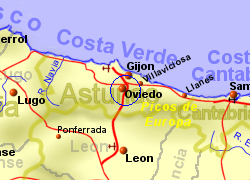 Pola de Laviana has a rail station connecting it to Gijon and Oviedo, with trains running approximately every hour during the day. 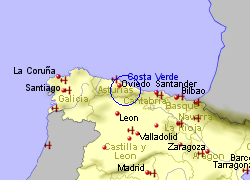 Map of the Pola de Laviana area. This beautiful holiday home is located in a spectacular scenic setting in the small village of La Castañal, with just 15 inhabitants. Situated at an altitude of 415 metres above sea level in the municipality of Bimenes, at the foot of the Sierra de Peñamayor. The road ends when you reach the Casa Madre Tierra Bimenes. When you head outside on your terrace, you only see mountains and forests with native trees: you will immediately feel a great sense of peace.